In March 2016, the Metropolitan Police Department (MPD) announced the expansion of recruitment of military veterans. The Department continues to encourage qualified applicants who have served in the Armed Forces of the United States, including the Organized Reserves and National Guard, for at least two years on active duty, to join the Department. A hiring preference for an eligible veteran includes additional points that are applied for the initial appointment to DC government service. Right now is a great time to be MPD. It is a great time for you to learn about an exciting sworn or civilian career with the Metropolitan Police Department. MPD offers a great starting salary and benefits for its sworn members and we offer many opportunities for advancement through our competitive promotional process. If you choose the Metropolitan Police Department, you will learn hands-on from some of the best public safety professionals in the country and get a chance to make a difference. 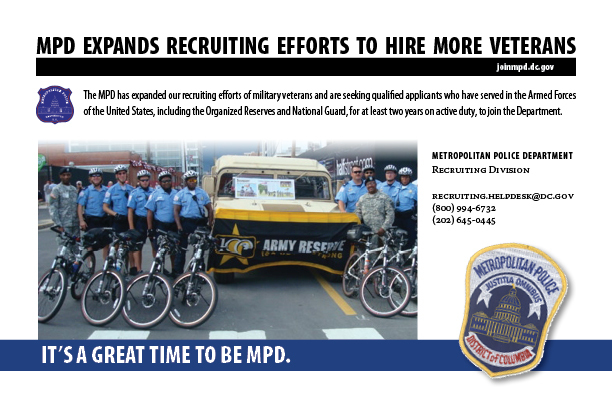 The MPD is also seeking qualified applicants to serve in civilian capacities. Each day almost 500 civilian employees serve the Metropolitan Police Department in a broad variety of administrative, technical and operational positions. Every member plays an integral role in day-to-day operations of the Department. Apply Today to be an MPD officer and join the ranks of the finest police department in the nation or learn more about civilian positions with the MPD.